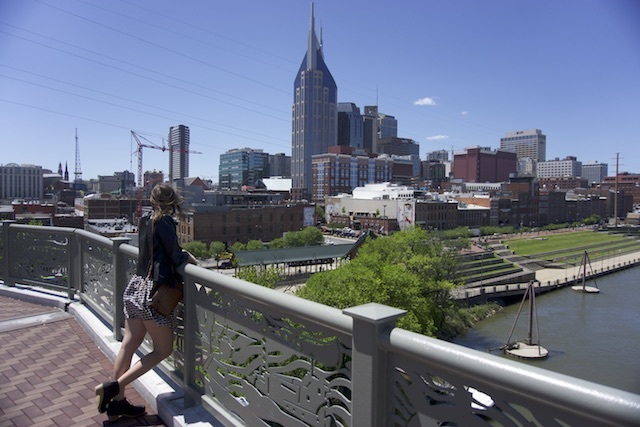 Nashville’s rightfully claimed its place as one of America’s favorite destinations. 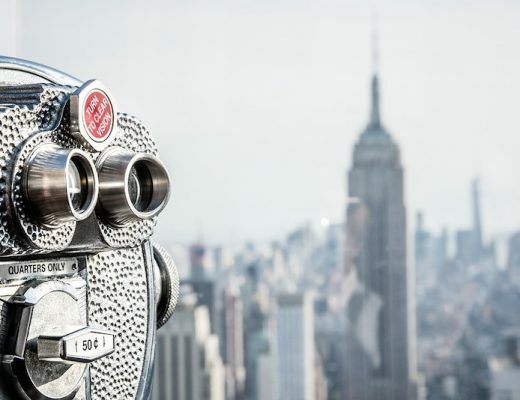 It’s got all the makings of the perfect 3-day weekend trip: delicious Southern food, funky bars, plenty of sights, and a great fun-loving atmosphere! You’re in the South, baby, so you’ve got to have some BBQ in Nashville while you’re here. 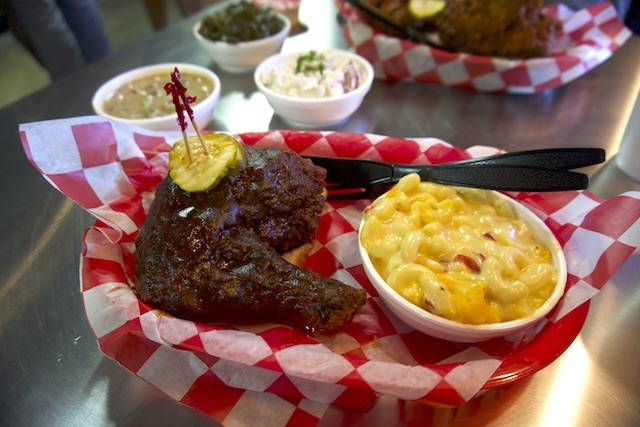 Martin’s BBQ is touted as some of the best in the city; Janet can attest to that. We also had amazing pulled pork banh mi tacos at Acme Feed & Seed right on Broadway. They have great $3 craft beer specials as well! Nashville is well-known for its music scene. 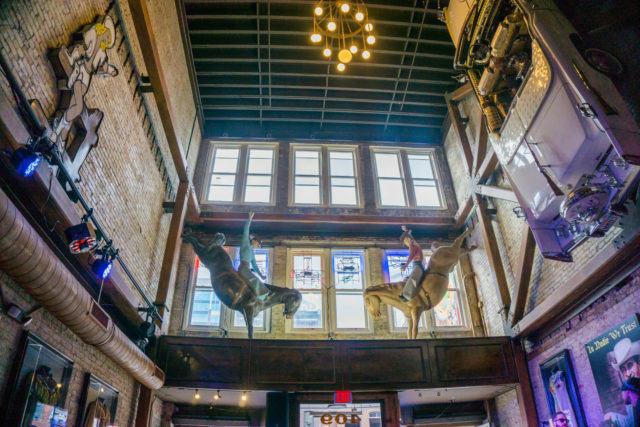 Whether you visit the honky tonks on Broadway or the famous Grand Ole Opry, you’re bound to hear some incredible music. 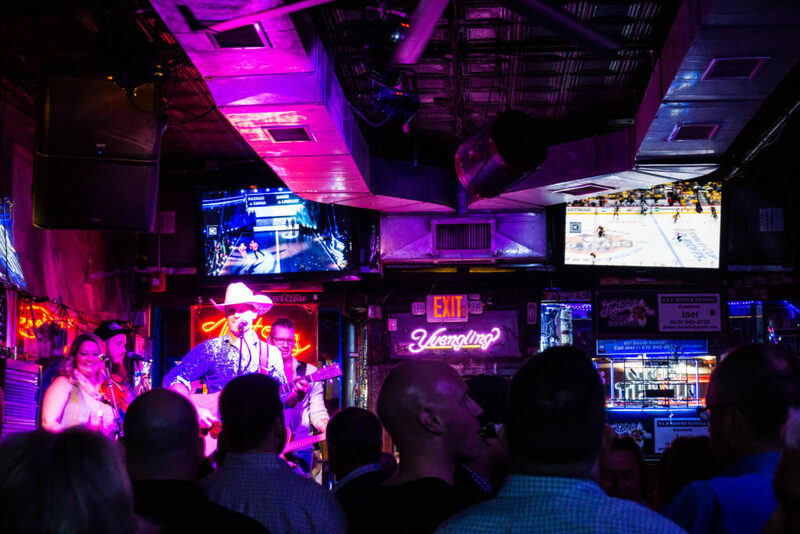 No weekend in Nashville is complete without checking out the local honky tonks, which are basically live music joints that play music from mid-day til the late night hours. Tootsie’s Orchid Lounge is my personal favorite. Entry is free but drinks are pricey as a result in order to offset that. If you’re trying to enjoy your weekend in Nashville on a budget, hit up one of the budget-friendly joints; Layla’s Bluegrass Inn is recommended as one of the cheapest places to drink in Nashville. Wondering what the must-sees are on your weekend in Nashville? 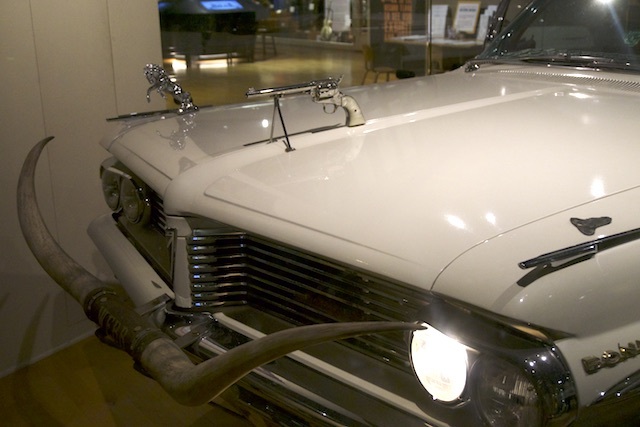 You can’t miss the Johnny Cash Museum, which celebrates the legendary artist. Full of outfits and instruments from Johnny Cash and June Carter, this museum is the perfect time capsule for his fans. The museum is small, just a few rooms, but it manages to perfectly tell Johnny Cash’s story through the items he left behind. 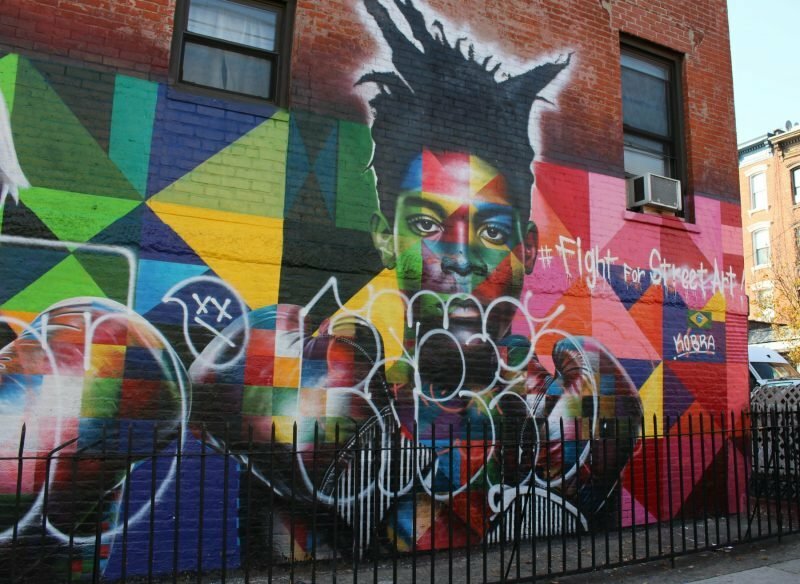 I entered not knowing much about Cash except that I adored some of his songs; I left with a full understanding of the depth of genius behind his music. Even though I’m not really a country music lover, it was interesting going to the Country Music Hall of Fame, if only for the awesome building its housed in. I enjoyed seeing the incredibly souped-up classic cars that put Cuba to shame — one was bedecked with fake guns, antlers, and silver dollars, I mean come on — as well as the fabulously ridiculous stage outfits on display. The famous John Seigenthaler Pedestrian Bridge in Nashville offers some of the best views of Music City, whether it’s day or night. I recommend making time to see this viewpoint, even if you have only 3 days in Nashville like we did! 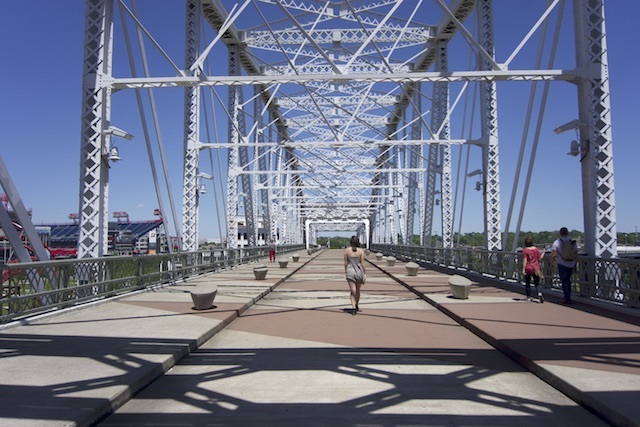 The bridge spans the Cumberland River and is famous for being one of the longest pedestrian bridges in the world, nearly one kilometer long. 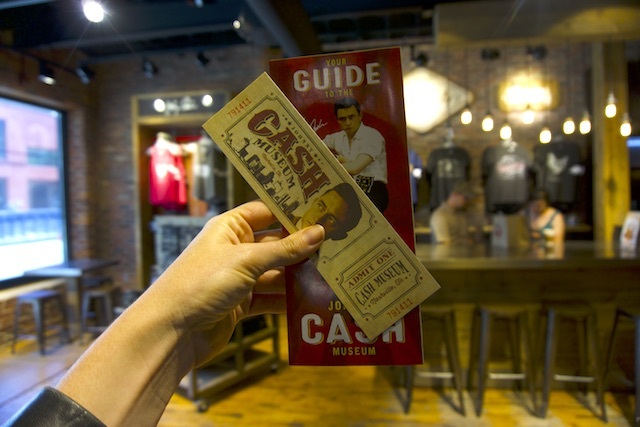 It’s convenient to go to after the Country Music Hall of Fame and Johnny Cash Museums, both of which are right nearby. It’s a great place to get Instagram photos to remember your weekend in Nashville. 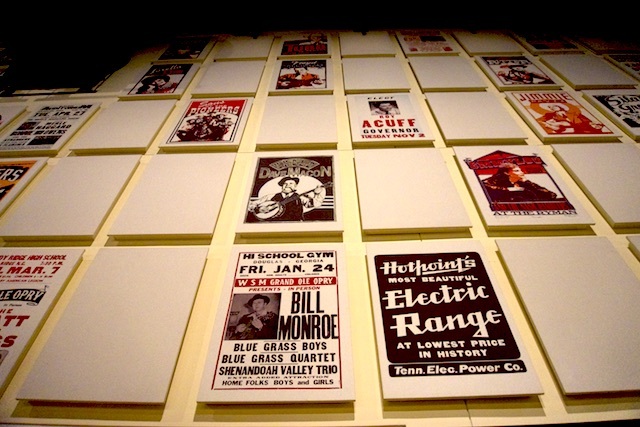 The Grand Ole Opry is a music legend for a reason: so many famous country music stars have made music history here. Famous musicians like Dolly Parton, Johnny Cash and June Carter, and Patsy Cline are all lifelong members. 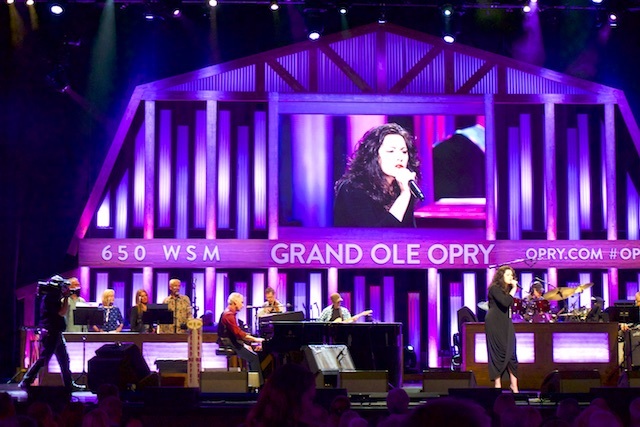 The Opry’s format is bit different than you’re used to; rather than having one main act, they have a series of artists who each play for about 10-15 minutes, followed by a headliner for the night who maybe gets 20 minutes of stage time. For me, the best part of seeing the Grand Ole Opry was getting to do a backstage tour at the end of the night. It’s worth it if only to see the epic dressing rooms and stand on the stage! Tickets can sell out, especially when popular acts headline, so be sure to book tickets in advance for the Grand Ole Opry here. You have to book a backstage tour separately. 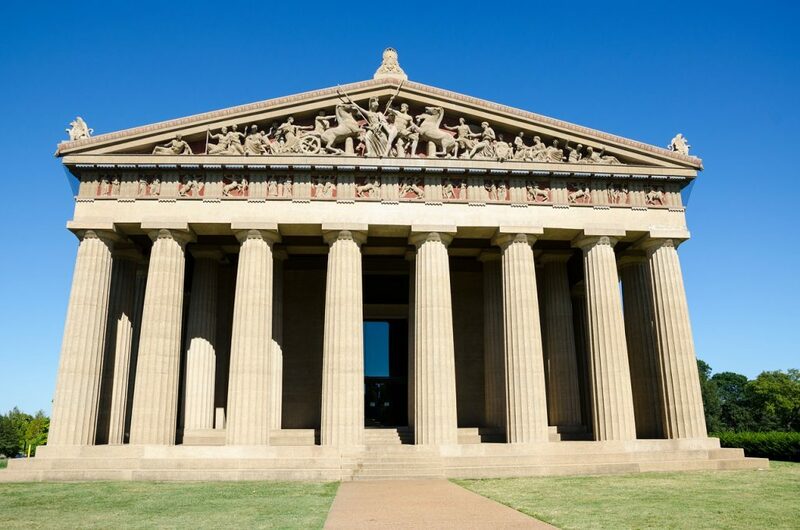 Who knew Nashville has its own replica of Athens’ beloved Parthenon? Centennial Park is located close to Vanderbilt University, a bit to the west of downtown Nashville. It’s worth strolling around if not to puzzle why Nashville of all places chose to build this strange and expensive replica. But Centennial Park itself is lovely, with walking paths, a dog park (the main draw), and plenty of trees to lose yourself in and forget the Music City skyline. Not far from Centennial Park, you’ll find Hattie B’s. Nashville is famous for its “Nashville hot chicken” – popularized by the likes of Anthony Bourdain, Andrew Zimmern, and foodies worldwide. The legend behind hot chicken is a bit hilarious: supposedly, a scorned woman spiced the hell out her womanizing husband’s fried chicken to teach him a lesson. Yet the revenge plot backfired when he ended up loving the chicken, turning the tables, and eventually opening up a restaurant using her recipe. 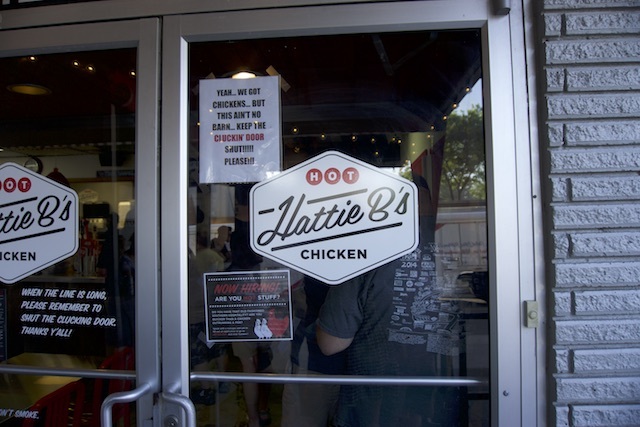 There are two prime spots for hot chicken that everyone recommends: Prince’s and Hattie B’s. Prince’s is the original, with at least 70 years of chicken history. 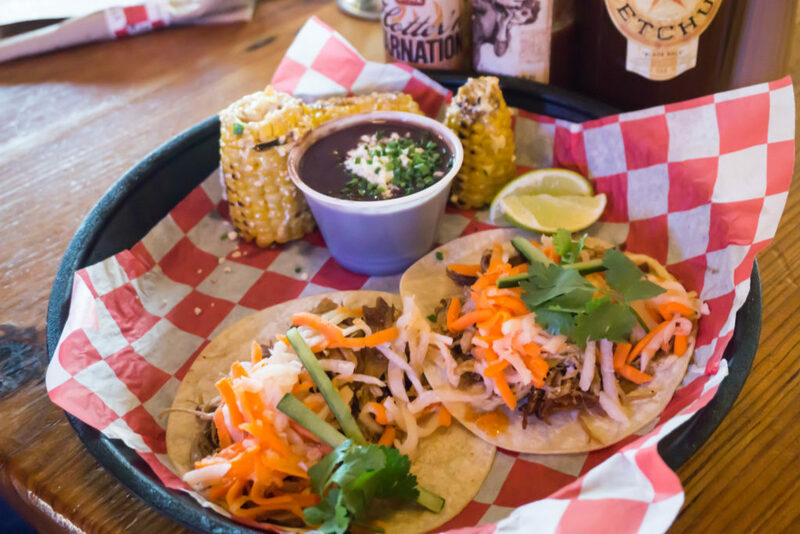 Hattie B’s is the upstart newcomer, but according to locals, it’s legit and serves the real deal. I chose Hattie B’s as it’s conveniently located near downtown. Irresponsibly and thinking way too high of myself, I ordered the Shut the Cluck Up, the hottest possible level. 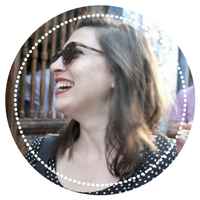 It’s hotter than I could have imagined – and it’s the kind of heat that sneaks up on you, kicking you in the mouth once you’ve bitten off more than you can chew. Literally. I ate about a quarter of the chicken before giving up and downgrading to the “Hot” (two levels down) chicken, which was just the perfect spice level for me – and I’m a certified spicy food lover. I’d suggest ordering at least one level down from what you think you can handle. It felt like there were snakes in my stomach the next day after eating the Shut the Cluck Up, and I didn’t even finish it! 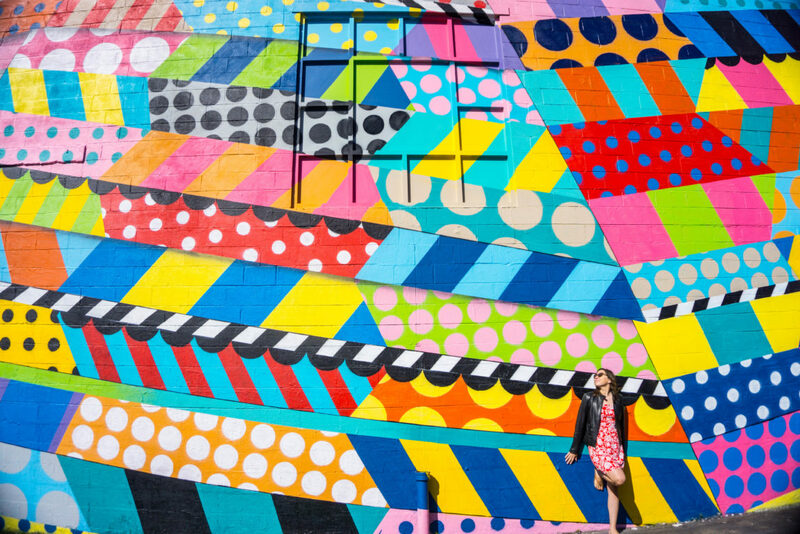 The Gulch is a funky district full of street art, brunch spots, and nightlife options that aren’t the main Broadway drag. 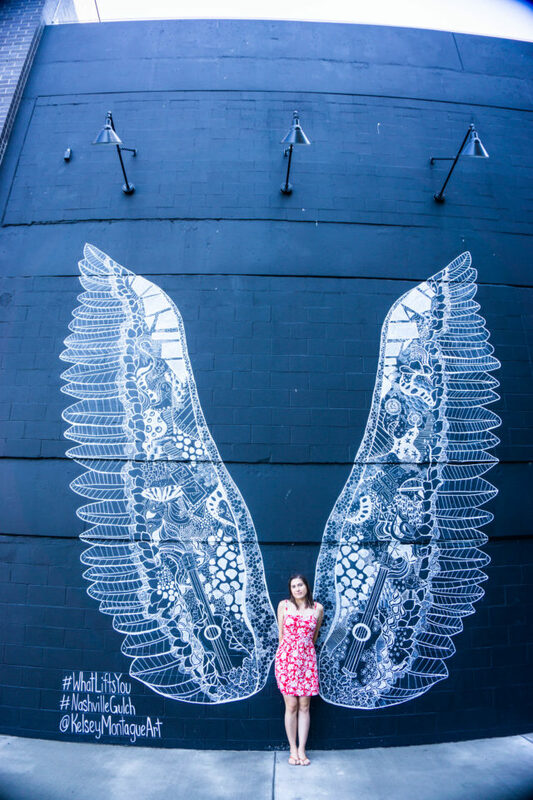 The famous “Nashville wings” are here – so get your Instagram gold here and make the most of your weekend in Nashville. Besides the Nashville wings, where you very well may have to queue in line for, there are also the Nashville Walls, a mural project that covers several enormous warehouses. 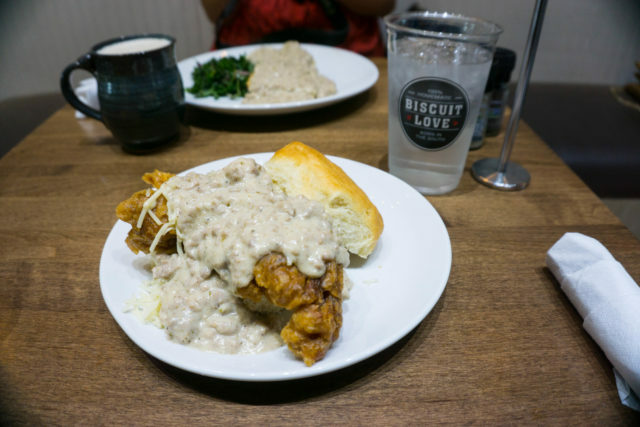 In addition to the street art, there’s the much-loved brunch spot Biscuit Love, which usually has a line out the door. Surprisingly, I was a bit disappointed by it, and I’m obsessed with biscuits. It was fine, sure – how bad can fried chicken covered in gravy on top of a biscuit be? But it most certainly was not even close to the best I’ve ever eaten. I think it’s one of those cases where the hype doesn’t meet reality, so you end up disappointed. Your experience may vary — and it’s definitely a photogenic brunch spot and a nice way to spend one of the mornings of your weekend in Nashville. I stayed at the SoBro Guest House, which has spacious suites with a bedroom, living room, and fully stocked kitchen (in fact, they will even stock it with groceries for you for a fee, which is something I’ve never seen any other hotel do). It’s basically an Airbnb meets a boutique hotel. There’s convenient mobile check-in and check-out, so you never have to deal with a front desk — you just get emailed the door entry code on your check-in day! If you arrive early or need to check out late, though, there is someone available who can help you store your bags. The décor is great — funky wallpaper, modern furniture, and even a working record player suitable for Music City! 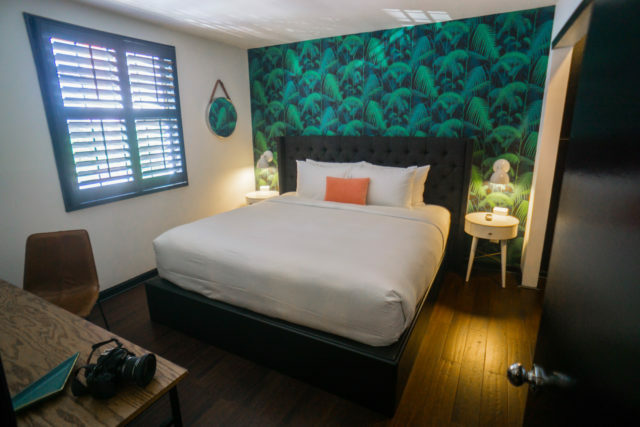 As I get older I truly start to notice how my mood lifts in aesthetically pleasing and well-designed rooms — and this couldn’t be more true for SoBro Guest House. 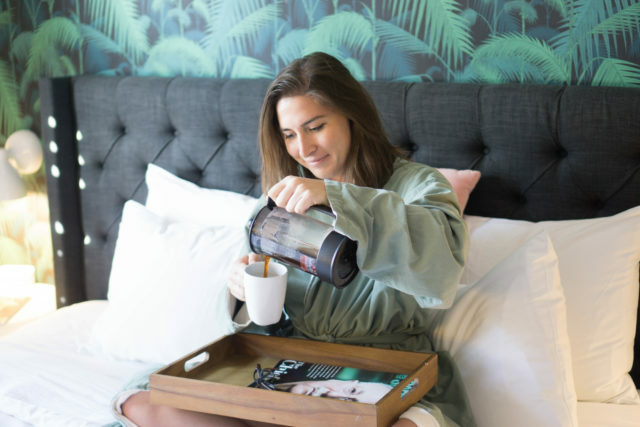 With adorable décor, a fully equipped kitchen, and even an on-demand grocery service, it’s definitely a step up from your average hotel room — and more convenient than Airbnb. Even better, it couldn’t be more conveniently located in the heart of downtown. 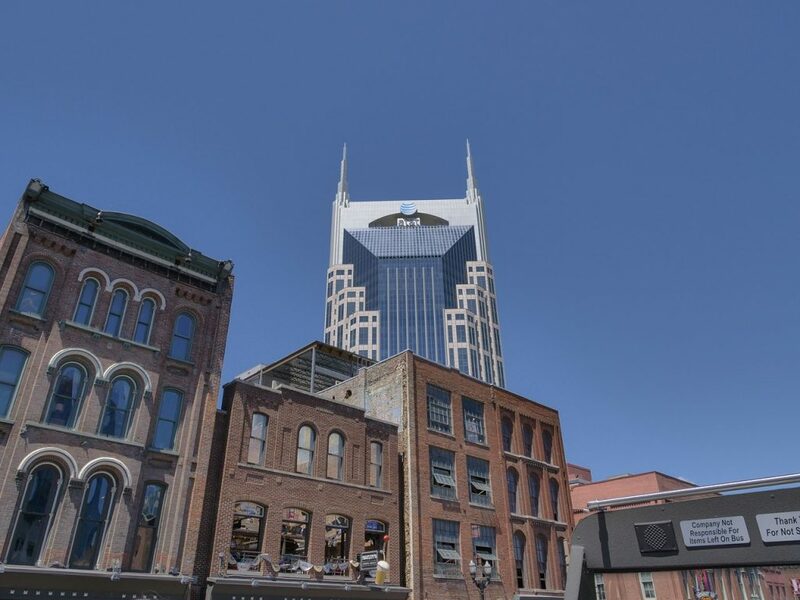 Check out availability at SoBro Guesthouse here – it tends to sell out as it’s one of the highest-rated properties in Nashville, with a 9.3 average rating on Booking.com and a great location a 10-minute walk from the honky tonks of Broadway. 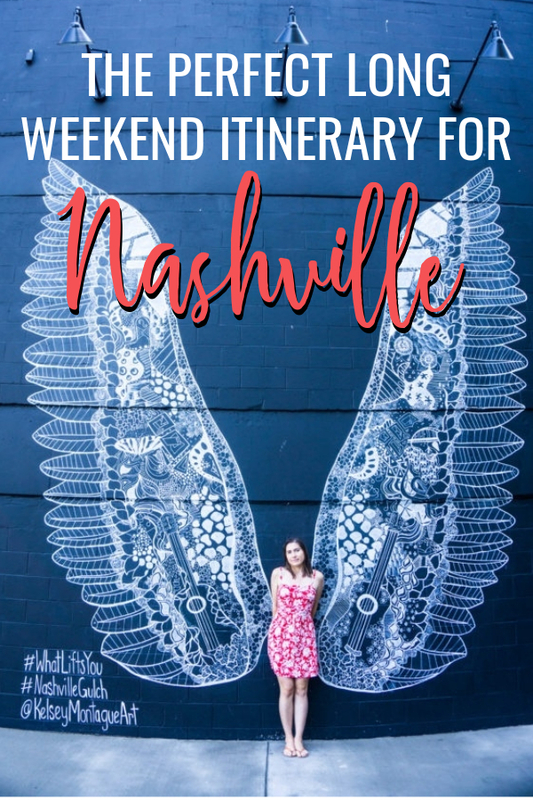 However, it is a little pricey for Nashville, so if you are trying to do a weekend in Nashville on a budget there are other options. True budget travelers will struggle in Nashville, as it’s hard to find anything under a hundred dollars a night that’s not by the airport, and then you’ll spend a lot of money on transportation to and from the city. The best budget option is Nashville Downtown Hostel, which has double and twin rooms as well if you prefer not to stay in a dorm. Check rates and availability here. Travelers who want a luxury hotel will have plenty of options. The Omni in Nashville is one of the newest, glitziest hotels, with a gorgeous rooftop bar and pool. 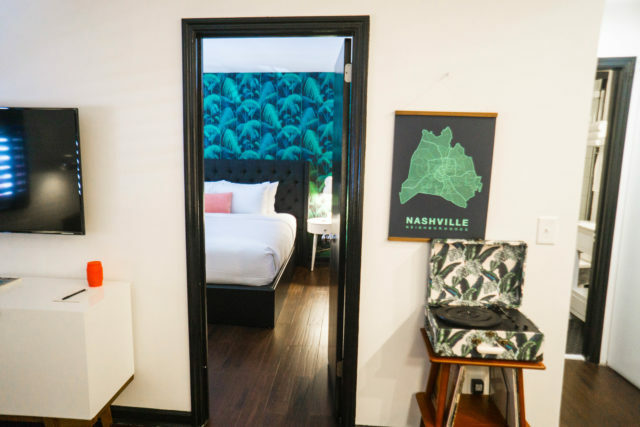 It’s one of the more glamorous places to stay for a weekend in Nashville and great for a girl’s getaway. 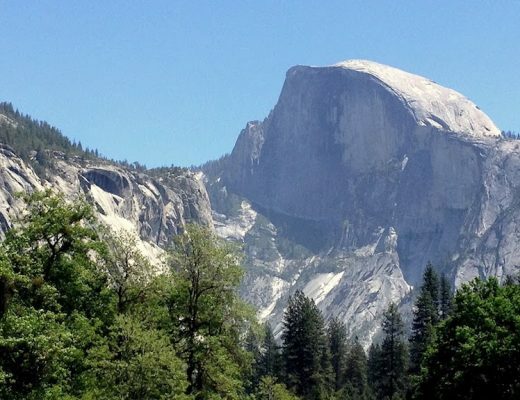 Check rates and availability here. Note: I was a complimentary guest of SoBro Guest House and received a press pass to see some of Nashville’s attractions. All opinions are my own.